On First Take Fridays a number of authors around Meeple Mountain give short first takes on games that are new to us. This week we have takes on Spell Smashers, Scorpius Freighter, and Coimbra. As a teacher I’m often telling children to use their words to solve their problems or express themselves– and that’s what you’re doing in Spell Smashers. This game is a mix between a dungeon crawl and a word game in which you will be fighting monsters using only your words (and sometimes fancy gear). Each round of Spell Smashers works the same way: players will simultaneously create a word from the letters on cards in their hand, fight a monster with the power generated from this word, and then visit the town to buy armour, elixirs, or brag about their battle at the tavern. Each Letter card will have an attack strength and type, with more common letters being less strong. The attack strength totaled from all the Letter cards used in your word will be the damage you deal to a single monster. When attacked, a monster will fight back and deal damage to you as Wound cards (featuring a combination of letters). Wounds will clog up your hand and lose you points at the end of the game unless you can find a way to use them in a word. 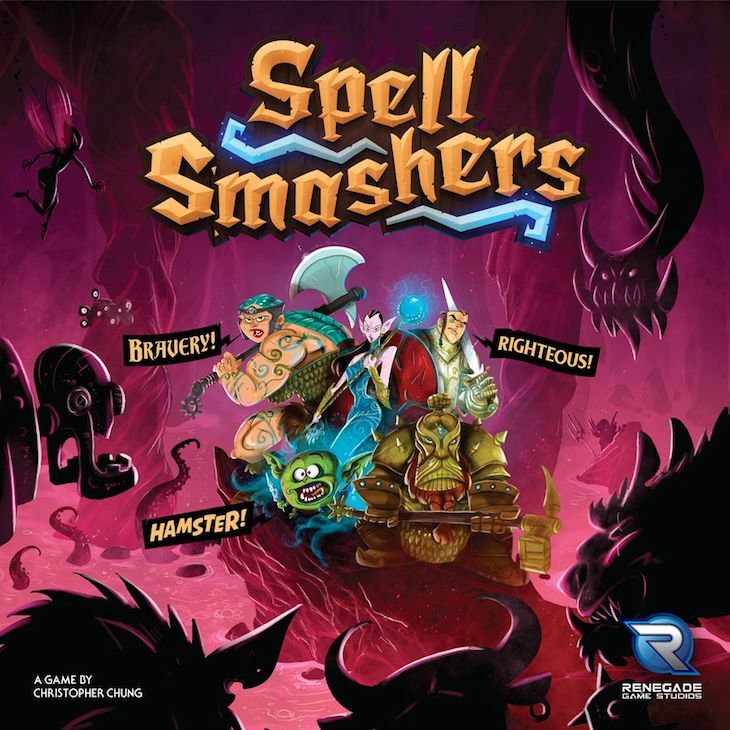 I enjoyed my play of Spell Smashers and I didn’t find anything wrong with the game itself (other than that there didn’t seem to be enough letter cards and money included). Even still, I question whether Spell Smashers has the power to stand out or whether it is just a one-and-done kind of game. I still can’t pinpoint who the target audience for this game is; I can’t see dungeon crawlers looking to add wordplay to their experience or Scrabble lovers wanting to add complexity to their word games. Unfortunately, as unique as Spell Smashers is, I feel I’ve already gotten everything out of the game. I’ve made no secret of my love for Automobiles, the stock car racing, bag-building extravaganza from AEG and designer David Short. New from this same team is Scorpius Freighter, a space themed game in which players act as rebellious freighter captains smuggling goods and information to thwart the oppressive government. I’ve been tracking this one for a month or two and finally had the chance to play it recently with Tyler Williams. 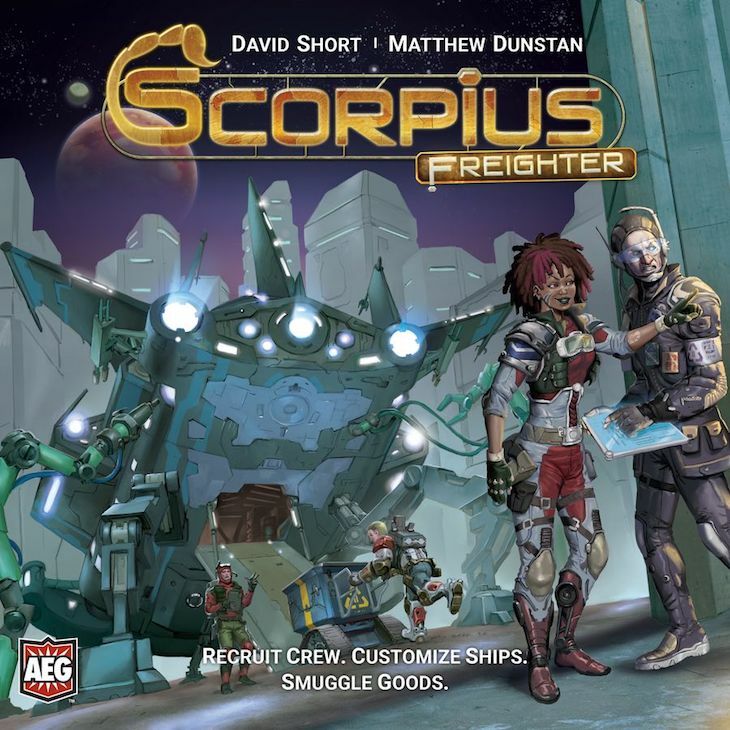 Scorpius Freighter is equal parts pick up and deliver, tile placement optimization, and resource management. Players exhaust crew members to move government owned freighters around 3 planets in the Scorpius system. After landing on one of the action spaces around the planet they may do that action a number of times based on their total remaining crew members. Actions include expanding storage capacity, using onboard equipment, loading cargo, meeting informants, and several more. Each action is a small piece of the end goal puzzle you’re working towards, which is to earn the most points. Scorpius Freighter is one of those rare games that really offers players lots of good choices on their turn. Each planet has a different set, and distribution of actions, which means you’re always having to decide which planet to work with. But you also need to manage how many skill points to use to get to a desired action space to make sure you have enough action points remaining to actually do that action. Scorpius Freighter is meaty and delicious and looks to be the sort of game that will continue to reveal it’s mysteries with repeated plays. Here’s hoping it gets that chance! The Renaissance in Portugal, Coimbra is the cultural and artistic hub of the country. Eggertspiele and designers Flaminia Brasini and Virginio Gigli (think Lorenzo Il Magnifico) bring us a new dice drafting eurogame. This is a stunning production. Colorful, whimsical art from Chris Quilliams gives this game a table presence not often found in Renaissance-period eurogames. In this game players draft dice to win the favor of citizens of Coimbra, increasing their influence on four tracks (council members, merchants, clerics, and scholars). The pip-value of the drafted dice will determine the order in which players have an opportunity to acquire a citizen’s favor. The pip-value also determines the cost of that favor, in one of two currencies in the game (guards or coins). After all recruiting is finished, players receive income based on their influence level in the areas matching the colors of the dice they drafted. Council members and merchants provide currency, clerics allow map movement (more on this in a moment), and scholars give in-game VP. Map movement, think Voyages of Marco Polo. Players will have opportunities to move a pilgrim meeple around a map in the center of the board that depicts the area surrounding Coimbra. By visiting surrounding villages, players gain bonuses. Additionally, each round, players will have an opportunity to invest in a voyage (end game scoring conditions). This game is fun. It is a blast to build your little engine, driven by the dice you draft and the citizens you aquire. There are an immense amount of ways to score points. This game is definitely a point salad. It is difficult to tell who is winning until the very end, making this game exciting the whole way through. This game scratches much of the itch I get from games we’ve seen from these designers (Lorenzo Il Magnifico and Grand Austria Hotel). It has the card drafting, engine building feel you get from Lorenzo paired with the dice drafting from Grand Austria Hotel. But, my impression after one play is that it is more interesting than either of the other two. I love the tension of drafting both for die value and color, and there appear to be many paths to victory. Also, did I mention that it is gorgeous? Coimbra won Best Euro of 2018 in the Meeple Mountain Diamond Climber awards!